Taylor Townsend won't be repeating last year's run to the third round of the French Open after a first round loss to the Czech Republic's Tereza Smitkova. But after an injury and a coaching change, she says she's ready to go back to the basics and rebuild her foundation of skills. 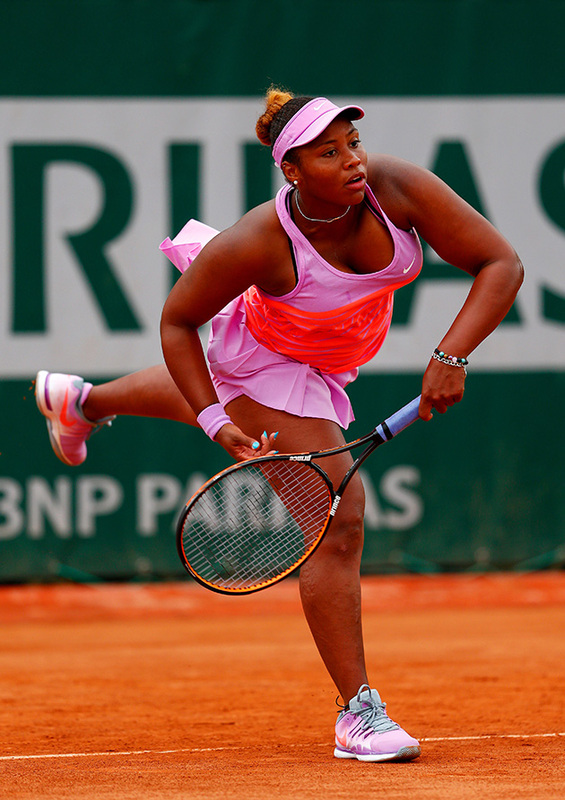 PARIS – Taylor Townsend won't be repeating last year's run to the third round of the French Open. Playing in her first main draw WTA match since March, the 19-year-old lost easily to the Czech Republic's Tereza Smitkova in the first round in Paris on Tuesday, 6–3, 6–4. After the loss Townsend discussed her decision, announced last month, to end her coaching relationship with Zina Garrison and Kamau Murray in favor of reuniting with Donald Young, Sr. The move was a surprising one, as Garrison and Murray were able to take Townsend into the Top 100. Now ranked No. 130, Townsend chose to return to her roots in hope of reinforcing the basics of her exciting but different game-style. Unlike the power-hitters that dominate the women's tour, Townsend prefers to play with more variety and net-play. That was the game she learned under Young, the father of ATP pro Donald Young, Jr., who introduced her tennis as a youngster. "He taught me how to play tennis, so he knows my game like the back of my hand," Townsend said. "He know my strokes and everything, the way I'm supposed to be playing. He knows the best way that I can play. He's seen me when I'm at my best playing the game that I know I can play. So I just wanted to get back to that and just go back to basics. Get back with my family and just try to build a strong foundation, base, and just get back grounded again. That Young is based in Atlanta, Ga., also motivated the change. Townsend spent last year splitting time between Chicago, where Murray was based, and Maryland, where she lived with Garrison. Townsend wanted to move back to Atlanta to be near her family. After her first full season on the WTA last year, Townsend has struggled to get results. She has won just two matches this year and missed much of the spring season after suffering a stress reaction in her ankle. The injury put her in an immobilization boot for weeks after Indian Wells. The time off gave her a moment to think about her coaching situation and where she wanted to take her game. "I wasn't using everything and all the strokes that I have, which was the different spins and the angles and dropshots and slices, chip and charge," Townsend said. "You know, all the stuff that kind of I would normally do I wasn't doing. I was hitting more flat—well not more flat, but more powerful and with more force. I was still trying get to the net, but it wasn't happening has often because I was hitting with more velocity versus spin or angles or something to make the other player move. "So I don't think [Murray and Garrison] were steering my game in a different direction. I just wanted to get back to someone that taught me how to do that. What better person to go to than the person that started your game and taught you how to play tennis." The increased baseline aggression was definitely noticeable at the start of the season. Townsend, a former junior No. 1, takes great pride in her hands at the net, which are some of the best you will see from a young player. But that's not the game that currently works on the women's tour (or the men's tour for that matter). The technological advancements in rackets and string technology, which allow players to hit with more pace and spin, combined with the move towards slower-paced courts, has virtually killed the idea of serve-and-volley in the modern game. Townsend is convinced variety can still work. "It's definitely something that can give players a hard time because they don't see it often," she said. "When you see one game, one way that things are, when you have something that's different, everybody has to adjust. So I just think it's something that makes me special and something that I can do. So I just want to incorporate it more and make that a more natural part of my game again." Her ranking will take a big drop after the French Open, putting her well outside the Top 150. Her schedule for the rest of the year is still up in the air and she'll need wildcards to get into the main and qualifying draws at WTA events. For now, Townsend isn't concerned. "I think I'm still at the beginning of my career," she said. "This is still like the stage where you want to have a strong base, a solid foundation and you want to really know your game inside and out so that you're solid. These are the times that you need to work on stuff so that as you get older and you play the older players and you become one of the older players...that you don't make the mistakes that you would make when you're this age and experimenting and trying things."